Stars Over Washington: June 1, 2015: George Washington's Progressed Full Moon! June 1, 2015: George Washington's Progressed Full Moon! Are Our American Hopes and Dreams Still 'Enshrined' in George Washington? May 25, 2015: Lately I've been messing around with Historical Horoscopes as I tend to do whenever the chance arises and couldn't fail to notice that first (official) President George Washington has a Secondary Progressed (SP) Full Moon upcoming--on June 1, 2015 @10Gem03! Opposite of course is his SP Sun @10Sag03 which conjoins SP Uranus (10Sag27), inventive planet of revolution, revolt, disruption, and genius. Sun conjunct Uranus denotes an original, unique, outstanding personality of genius and innovation--and a rebel or maverick, of course. Enlarge the image to read a few notes penned on (messily, as usual) and read on, if you wish. I consider Washington's current progressions to be the evolution of his society's opinion of him as president and as all that he has been to our nation or has been made to seem. I refer to Mason Locke Weems, aka, Parson Weems, who may be most responsible for George Washington's near-mythical status in American culture and the 'cult of personality' with which we garnish him and all subsequent presidents (as long as they don't become too tarnished by their own sorriness!) Read The Fable of George Washington and the Cherry Tree from Weems' The Life of Washington, written shortly after Washington's death in December 1799. So how has Washington evolved from his birth in 1732 to June 1, 2015, and what is a Secondary Progressed Full Moon anyway? The SP Full Moon is a culmination phase of fulfillment which issues from a natal horoscope and provides details on how an individual's birth potential has changed through the years to whatever date is specified. Although George is long passed away, his natal planets of February 22, 1732 continue to be contacted by transits and progressions; even planetary returns to natal degree can be significant. Certainly the more prominent the figure and imposing the natal horoscope, the more significant may be changes to the related charts and a character's continued influence. Here, we see a significant, prominent man of his era who remains so in 2015 as the first archetype of The Leader of the United States of America and there are several reasons for his high status which I have discussed in previous posts and will not go into now. And if you seek Freemason references, check the Sabian Symbol of SP Pluto for '20 Libra' which hints at more occult information. Also, scroll to the sidebar Search field and type in his name for more articles on such topics. Obviously, as America's Commander-in-Chief of the Continental Army, we continue to honor his vast contribution--the hardships he faced and the sacrifices made. And note that the Sabian Symbol for '1 Sag"..."A Grand Army of the Republic Campfire"...now rests on his SP 11th cusp @00Sag30 in this SP Full Moon chart denoting a time of harvest and reward and by this I refer to those who now wear Washington's mantle of power--and those hiding behind it. Notably, it is the 5/11 axis of Self Will and Creative Pursuits in focus here including Washington's SP Nodal axis of Future Direction. And there is SP Mercury @17Sag16, planet of Thoughts, Communications, and Plans, joining the Groups and Associations duo of Sun-Uranus. 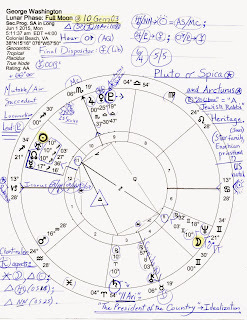 Also in focus is the 3/9 axis of Philosophy, Religion, Foreign Lands, and the Lower-Higher Mind with a power trio that relates to wealth in 9th house: Jupiter @00Sco37, Venus @25Lib30, and Pluto @19Lib47. This planetary trio may signify foreign donors and the powers controlling the US government from abroad (always the case--Washington was a central bank 'fan' with Hamilton) and one suspicion is The City of London, the UK's financial sector. Sun-Mars (activities; vigor; soldiers; surgeons; intellectual fighters) = ASC: cooperative teamwork; total devotion to a cause. Mars-NN (collaboration; disputes) = ASC: energetic cooperation; family ties; good fellowship. Mars-Pluto (superhuman power; force; brutality; objectives obtained by ruthlessness; people disabled by war) = Mercury: a desire to realize fanatical plans; presence of mind; excessive nervous irritation. In America, the continued popularity of Founder George Washington as a national figure and important historical personage may be seen in part by Venus-MC (love; affection; attachment; vanity; conceit) = Jupiter. 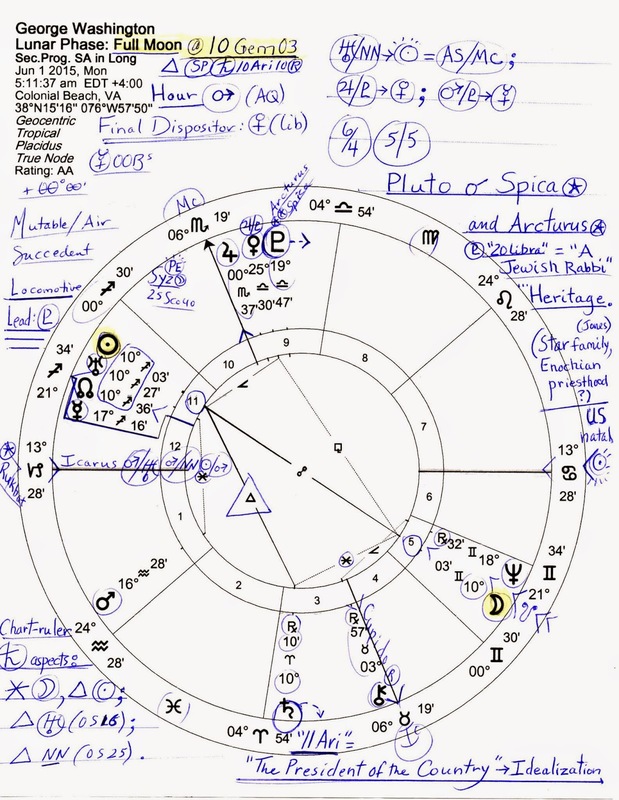 The last SP factor I intend to discuss with you on the occasion of this major turning point for President George Washington--unaware of it though he be and possibly marking a limit to his or our global reach upon the world stage--is the chart's planetary pattern called a Locomotive with its lead planet (engine), Pluto. As you know, Locomotive patterns indicate genius and a determined drive toward success of the sort found in executive positions--and its power tends to overshadow a person's flaws until 'absolute perfection' seems to be the case. And though it's true that this is a progressed Locomotive, I suspect that it's our current crop of Washington politicians who benefit from this pattern which actually shows up in Washington's natal horoscope as a Bucket pattern, a Bowl with a 'handle' planet. In George's natal chart, the handle planet that carries the rest of the planets is his mystical Neptune @14Gem40 Rx in the 1st house of Self. This resonates with Washington's natal Sun in mystical Pisces and his early joining of secret societies such as the Freemasons, an organization he adhered to all his life. He swore his presidential oath upon a Masonic Bible, in fact, then leaned down and kissed it (a Masonic ritual). You've seen images of him dressed in his fancy Masonic apron, right? In Gemini, natal Neptune echoes his tendencies toward mysticism and occult studies, visions, fantasies, illusions, not being what he seems (he was ambitious for power), and the placement gave him a love of nature and a talent for inspired communications (his use of spying comes under such guise!) Now in Libra, SP Pluto provides extraordinary powers of assertion within the environment, the family, and the public (assertions aimed at us), plus, manifestations of genius and celebrities who benefit or harm humanity. "Robin Hood as a young boy plays truant from school to go to his archery lesson, but ends up teaching his card tricks to his master." The 'robbing from the rich to give to the poor' fellow! Well, that's all I care to say for now about George Washington's SP Full Moon of June 1, 2015 which times the limit of his and perhaps Washington DC's reach in the outer world. Perhaps when June 1st arrives-- a date which also times the potential sunseting of section 215 of the so-called US Patriot Act, unconstitutional as it is-- you'll give a small thought, fond or otherwise, to our first president and his SP Pluto, conjunct Spica (the Washington Monument) and Arcturus (the White House) as it chugs our nation forward toward whatever ultimate goal our Founding Father and his colleagues had in mind for this, our 'New Rome'.